During the past 9 years, reports of 'port-site' deposits following laparoscopic surgery for malignancy, especially laparoscopic resection of colonic cancer, have cast a shadow on the wisdom of the laparoscopic approach in the surgical man- agement in patients with cancer. 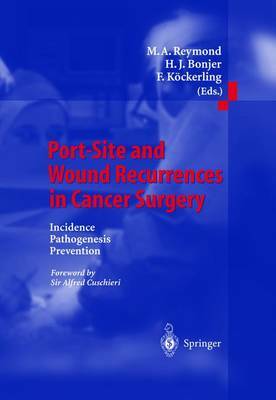 Those reports of port-site deposits, some 90 cases reported in the literature up to 1999, have opened a 'can of worms' and highlighted the scarcity of our knowledge on cancer cell migration from solid tu- mors and the factors that underlie their successful implantation in surgical wounds both in the presence and absence of a positive pressure pneumoperito- neum. The jury is out even in relation to the effect of the healing surgical access wound - do the biochemical and cellular repair processes and the associated growth factors enhance or prevent implantation of exfoliated viable tumor cells? Whatever the answer to this question, it is clear that tumor cells do implant in healing surgical wounds and the key question is whether this is facilitated by lap- aroscopic surgery with CO pneumoperitoneum compared to the traditional 2 surgical exposure. It is known that tumors shed malignant cells into the blood stream, the peritoneal cavity and in the case of hollow organs, intraluminally. Equally there is good evidence that surgical and instrumental manipulation of tumors induce exfoliation of viable tumor cells.